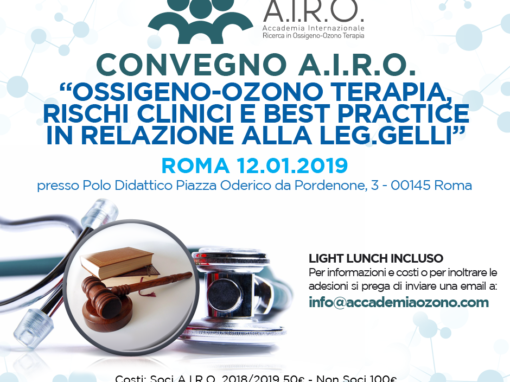 Intensive Workshop: “OSSIGENO-OZONO TERAPIA NELLE PATOLOGIE VETERINARIE” - Roma 25.09.2016 - A.I.R.O. 75€ Soci AIRO – 125€ Iscritti Ordine Veterinari Roma E Lazio* – 230€ Non Soci. S. M. Al-Dalain, G. M. Sánchez, E. Candelario-Jalil, S. Menendez, L. Re, A. Giuliani, O. S. León-Fernández. Ozone treatment reduces biomarkers of oxidative and endothelial damage in an experimental diabetes model in rats, Pharmacol Res, Vol 44(5), 391-396, 2001. Said Mohammed AL-Dalaina, Gregorio Martineza, Eduardo Candelario-Jalila, Silvia Menendezb, Lamberto Rec, Attilia Giulianid and Olga Sonia Leon. Ozone treatment reduce plasma oxidative stress and pancreas damage in streptozotocin-induced diabetes model in rats, in press, Redox Report, 2002. Ablondi M. – Tesi di laurea 1996, Università di Parma Facoltà di Medicina Veterinaria. ASPETTO FARMACOLOGICO DELL’IMPIEGO DELL’OZONO IN MEDICINA BOVINA. Ancaux Y. – Thiry E. – Pastoret P.P. – Ligot J. – Annales de Medicine Veterinaire 126 (4), 1982, 327-333. EFFECT OF OZONE ON INFECTION BOVINE RHINOTRACHEITIS VIRUS (Bovid Herpesvirus). Bieniek, Remmers – Zeitschrift fur versu chstierkunde, 23 (3), 1981, 172. OZONIZATION OF DRINKING WATER FOR LABORATORY ANIMALS. Bolton D.C., Tarkington B.K., Zee Y.C., Osebold J.W. – Environmental Research 27 (2), 1982, 476-484. THE BYOLOGICAL EFFECTS OF OZONE ON REPRESENTATIVE MEMBERS OF FIVE GROUPS OF ANIMAL VIRUSES. Bucca S. – Tesi Laurea Medicina Veterinaria Torino (1977). L’IMPIEGO DEI TESTS ENZIMATICI NELLA CLINICA EQUINA CON CONTRIBUTO PERSONALE. Chatelus P. – These pour le doctorate veterinaire (1991), Ecole Nationale Veterrinaire D’Alfort. CONTRIBUTION AL’ETUDE DES TRANSAMINASE SERIQUES CHEZ LE CHEVAL DE SPORT. Cornelius C.E., Rurnham L.G., Hill H.E. – J.A.M.V.A., Vol. 142, n°6, 1963, 639-642. SERUM TRANSAMINASE ACTIVITIES OF THOROUGHBREDS HORSES IN TRAINING. Moore GS, Calabrese EJ, Schulz E. – Bull Environ Contam Toxicol. 1981 Feb;26(2):273-80. EFFECTS OF IN VIVO OZONE EXPOSURE TO DORSET SHEEP, AN ANIMAL MODEL WITH LOW LEVELS OF ERYTHROCYTE GLUCOSE-6-PHOSFATE DEYDROGENASE ACTIVITY. Moore GS, Calabrese EJ, Williams P.J. – Journal of enviromental science and healt 18 (1), 1983, 241-246. EFFECTS OF IN VIVO OZONE EXPOSURE TO DORSET SHEEP, AN ANIMAL MODEL FOR THE RESPONSE OF G-6-P DEHYDROGENASE DEFICIENT HUMAN ERYTHROCITES TO A PROPOSED SYSTEMIC TOXIC OZONE INTERMEDIATE, METHIL OLEATE HYDROPEROXIDE. Persistent rhinitis and epithelial remodeling induced by cyclic ozone exposure in the nasal airways of infant monkeys. Carey SA, Ballinger CA, Plopper CG, McDonald RJ, Bartolucci AA, Postlethwait EM, Harkema JR. Am J Physiol Lung Cell Mol Physiol. 2011 Feb;300(2):L242-54. 10.1152/ajplung.00177.2010. Epub 2010 Dec 3. Schulz S, Häussler U, Mandic R, Heverhagen JT, Neubauer A, Dünne AA, Werner JA, Weihe E, Bette M. – Int J Cancer. 2008 May 15;122(10):2360-7. doi: 10.1002/ijc.23382. Changes in leukocyte population after ozonated autohemoadministration in cows with inflammatory diseases. Ohtsuka H, Ogata A, Terasaki N, Koiwa M, Kawamura S.
Epithelial and inflammatory responses in the airways of laboratory rats coexposed to ozone and biogenic substances: enhancement of toxicant-induced airway injury. Harkema JR, Wagner JG. – Exp Toxicol Pathol. 2005 Jul;57 Suppl 1:129-41. Review. J Vet Med Sci. 2006 Feb;68(2):175-8. Intramammary application of ozone therapy to acute clinical mastitis in dairy cows. Effects of ozone and airway inflammation on glutathione status and iron homeostasis in the lungs of horses. – Mills PC, Roberts CA, Smith NC . Am J Vet Res. 1996 Sep;57(9):1359-63.